This arachnid was found in a quiescent, hibernation-like state beneath a rock in the Phoenix Mountains Preserve, Maricopa Co., Arizona, USA. 26 Dec. 2008. Identification was made by Kari M McWest. Although the sting of this very common scorpion is reportedly quite painfull, it is not dangerous and the harm soon vanishes. 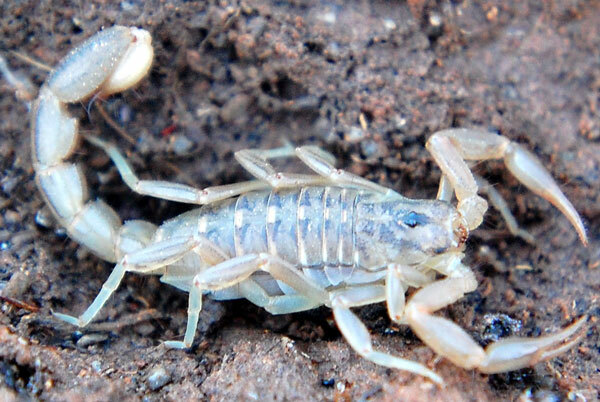 Stripe-tailed Scorpions are very unlikely to be found inside human dwellings - the habitat is simply too dry and besides these scorpions are not good climbers like Arizona Bark Scorpion (Centruroides sculpturatus), which does inhabit houses. Stripe-tails prey on various arthropods that they find beneath rocks or cattle dung. Termites are an important prey item. Book Reference: Venomous Animals of Arizona by Robert Smith (who was one of my profs at U.A.) available at Abe Books.